Fill-out the below online form to get free no-obligation quotation or call us on 0800224000. Cash for Car Wrecking & Removal in Hamilton, Tauranga, Rotorua & throughout NZ. At Car Removal NZ, we will take care of all your old, unwanted, broken, used, scrap, smashed and damaged vehicles including Cars, Vans, SUVs, 4WDs & Trucks and all utility (utes) and commercial vehicles. We accept all makes and models from car manufacturers – from Toyota, Nissan, Mitsubishi, Isuzu, BMW and Holden to all makes and models of Japanese, European, Korean and American made vehicles. Do you have an unwanted, broken, accident, scrap, wrecked, damaged, old or late model car? Get INSTANT CASH for your car from Car Removal NZ. We pay top dollar for all vehicle makes and models. No matter what is the vehicle condition? We’ll visit your place and remove your vehicle at no charge – in fact, we’ll pay you cash for it. We provide free car removal services. We specialise in the removal of unwanted, old as well as smashed cars and pay top dollar for your vehicles. We buy scrap vehicles, late model vehicles, accident vehicles, insurance write off, running or not running vehicles or WOF failures. We are the leading cash car buyers of scrap vehicles in New Zealand. We offer free vehicle removal service, whatever the condition your vehicle, throughout New Zealand including Hamilton, Tauranga, Rotorua, Auckland, Wellington and Christchurch. Get a free quote for our car removals services on 0800 22 40 00. Is your old car sitting out the front of your property? Or is that broken down car, van, 4WD, truck or other commercial vehicle rusting and covering space on your property? Our car removal service is free and we pay you top Cash for your Unwanted Cars, whether they are Old, Scrap, Broken, Junk or Damaged Vehicles. Car Removal NZ removes unwanted cars and vehicles throughout Hamilton, Rotorua and Tauranga. Here at Car Removal NZ we take the stress and worry out of taking your car to the wreckers. We are one of the leading car removal company in New Zealand and provide a free service for removing your old, broken down vehicle that was stopping you from bringing your new ride home. 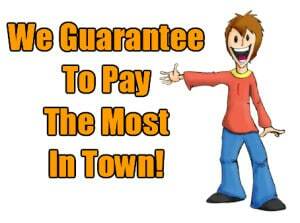 Additionally, we even pay you cash on the spot, no matter how damaged your vehicle is. All you need to do is give us a call and come to your place at a time convenient to you with our vehicle removal truck. You can let us take care of the rest! Call us now on 0800 22 40 00 to book your car removal service in Hamilton, Tauranga or Rotorua. Our North Island car wrecking service specialises in removing all types of vehicles like cars, vans, 4wd and trucks. We have a network of scrap yards and wrecking yards across South Island who pay cash for scrap cars, high-mileage cars, damaged, wrecked or just plain worn out old cars as well as scrap cars, vans, trucks and SUVs. They don’t have to be running for you to get good cash. Our car removal service covers most of town and cities in South Island, New Zealand – Our removal process is always reliable, fast & FREE. Call Us Now: 0800 22 40 00 - To check availability please call for the service area. We service following areas: Auckland - Wellington - Christchurch - Hamilton - Tauranga - Napier-Hastings - Dunedin - Palmerston North - Nelson - Rotorua - New Plymouth - Whangarei - Invercargill - Whanganui (Wanganui) - Gisborne. Contact us today to find out how to turn your unwanted car into cash! We Buy All Makes and Models of Cars, Trucks, UTES, Vans, 4WD or Other Commercial Vehicles: Hino, Toyota, Ford, Nissan, Mitsubishi, Daf, Mazda, Scania, Fuso, Isuzu, Man, Freightliner, Iveco, Kenworth, Mack, Mercedes-Benz, Volvo, Holden etc.